We all recognize this shapely circle character right away, now instead of a boring yellow Pac-Man try out the all new gold foil Pac-Man. Featured on this t-shirt is a very large Pac-Man with his mouth wide open ready to eat ghosts and cherries, the really fun part about this new Pac-Man is he is foil and gold in color. This Pac-Man gold foil t-shirt is available in sizes Small, Medium and large, it is a juniors fit which means it is designed to hug your bodies curves and fit a little snug being super comfortable too. 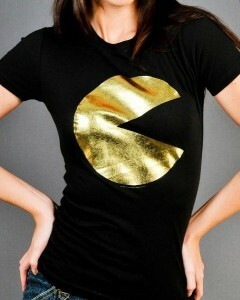 Have a closer look at the Pac-Man Gold Foil T-Shirt.